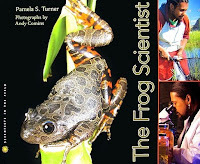 The Frog Scientist by Pamela S. Turner, photographs by Andy Comins. (Grades 5-8.) Houghton-Mifflin Harcourt, July 2009. Copy provided by my local library. The information is a great blend of personal information about Tyrone and scientific information about his work and the plight of different frogs worldwide. Many frogs are disappearing due to habitat destruction, diseases, and possibly because of pesticides. Tyrone hypothesizes that a popular pesticide called atrazine is causing deformities in frogs and his experiments try to prove it. Not only is the narrative accessible and interesting, but the gorgeous color photographs add a lot to the book. Comins includes photos of many kinds of frogs of all sizes and colors as well as photos of Tyrone, his family, and his lab assistants. The symbiosis between the text and the photos is really well done, drawing the reader in from the first page. It's the first thing I noticed when I opened the book and I knew I was in for a treat. PLUS, it's great to see a person of color featured in this series. Here's hoping there's more of that to come! Of course the book includes resources for further reading, an index, and a glossary. It also includes a photographic guide to all the frog species mentioned in the book. I'd be surprised not to see a shiny Sibert sticker on this one, come January. Extremely well done. Read more reviews at The LibrariYAn, The Hungry Readers, Lit for Kids, and A Patchwork of Books, and don't miss this interview with author Pamela Turner at Of Books and Boys. Happy Nonfiction Monday! Go check out the round-up at Practically Paradise. This book was one of the coolest NF ones of the year. Awesome photography! I agree about the Sibert. It was great to see all the blogs on it. I loved it and blogged it, too. The appeal of the frog photos and the use of the scientific method provided an inside look at how research is really done. I'd love to meet Dr. Hayes, too.